In late December 2018, with just four divers underneath my belt, I signed up for my first liveaboard near the Surin Islands of Thailand. We departed from Khao Lak in the evening and took a 1.5 hour van to a port up north. We boarded the boat and had our first dive briefing. 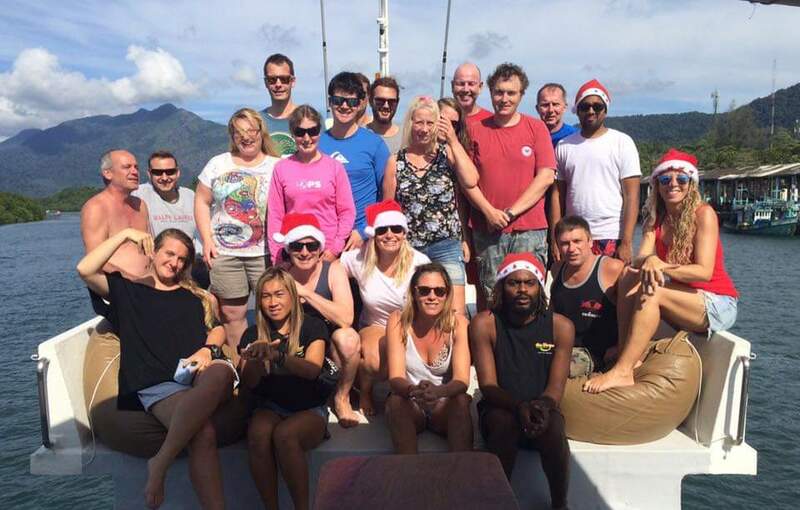 There were 17 customers (15 divers, 2 snorkelers), 4 dive guides, and 4 crew (including a cook). Unsurprisingly, the customers were pretty deep into their diving careers. One runs a dive shop, one used to run one, and the rest had logged atleast 50 or so dives. I was intimidated but I used it as an opportunity to pick their brain and work on becoming a better diver. The days started early, usually around 6AM or so. Everyone’s body clock was off so it wasn’t a problem. Besides, the sunrises in the mornings made it worth it. We’d have our first dive at around 7AM. This is where a dive guide would visually map out where we’re diving, the depths involved, the currents involved, and what sort of life we’d see. These dives were usually the best because of the high visibility. Afterwards, we’d eat breakfast (western), dive again, eat lunch (Thai), dive again, and then eat dinner (Thai). The first day had four dives which was rough. It definitely felt like a marathon and I was more focused on completion than having fun. The night dive, at the end of day one, was the only time on the trip when I was spooked out. It was my first and it definitely felt surreal being enveloped in the darkness. The next day was three dives and the last day was two. We went to Koh Tochai and then cut north to Ko Surin Tai. We got a chance to deboard here which was a nice break. The highlight was Richelieu Rock - incredible diversity of life and amazing coral. Truly a hustling and bustling city over there. Diving aside, it was like camping in the sea. When we weren’t diving, we were reading, laying out in the sun, meeting each other, eating, or sleeping. Everyone, from the divers to the crew to the dive guides were awesome, down-to-earth people. The lack of cell phone signal was bliss. I need to work on my air consumption. In my group, I was the weakest link which meant we had the shortest dives. This was not a good feeling. I think this has to do with me excessively kicking, using my hands and arms (I know, I know), and not having a handle on my buoyancy. I think learning how to frog kick might do some good. Speaking of buoyancy, I’ve gotten better but still need some help. I now have a better handle on how much to pump my BCD once I descend. I also know now that I need to steadily release some as the dive continues and we slowly ascend. My basic problem is that I keep drifting down while leaning upwards. Currents are real. I have never experienced currents like I did on this trip. I think the key is to understand their direction and change depth and trajectory to avoid the current. I made the mistake of trying to fight it a couple times before wising up. There were a total of 9 dives and I saved bringing my camera for the 8th. I’m glad I had some self control here - I’m not ready for a camera just yet. It’s too many variables to keep handle of and it showed - my footage was shaky and didn’t have any closeups. Overall, I had an awesome time and wouldn’t hesitate to do it again. If anyone from Sea Dragon is reading, thanks for the awesome experience!